This is a souvenir dish from the 1939 New York World's Fair, featuring the Trylon and Perisphere. It was made by Diecasters, and is marked on the bottom with the company logo and the words "MADE IN U.S.A. DIECASTERS NEW YORK". The dish is 5-3/4" in diameter, the Trylon is 4" tall, and the perisphere is 1-1/2" in diameter. 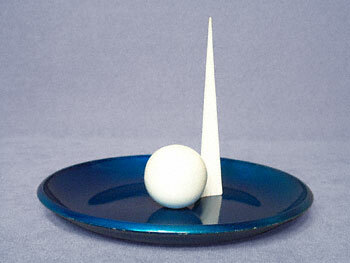 The base is a blue enameled metal with a gloss finish inside, and the Trylon and Perisphere are both white enameled metal. The base has some paint chipping around the edge as can be seen in the photo, and some paint imperfections which can only be seen if viewed at a certain angle. This piece is in overall excellent condition.